The Baltimore Ravens traded defensive tackle Timmy Jernigan and a third-round compensatory pick to the Philadelphia Eagles in exchange for their third-round pick, it was announced Tuesday. The Ravens will move up 25 spots in the third round -- from No. 99 to No. 74 overall -- in exchange for a starting defensive tackle who likely was not going to get re-signed after this season. Baltimore now has four of the first 78 picks in this year's draft. Jernigan, a second-round pick in 2014, was Baltimore's best interior pass-rusher, but his production -- as well as his snaps -- declined in the second half of last season. He had five sacks in his first nine games and none in the final seven weeks. "Timmy has been a terrific player for us for three seasons," general manager Ozzie Newsome said. "This will allow our young group of defensive linemen an opportunity to compete and play." With the Eagles, Jernigan will help fill the void at defensive tackle left by Bennie Logan, who signed this offseason with the Kansas City Chiefs via free agency.Logan started 43 games over the past three seasons for Philadelphia and had a career-best 2.5 sacks in 2016. "We are excited to add Timmy Jernigan to our defensive front. It was hard to move down in the third round, but we believe in building along the lines, and he is a good fit for our scheme," Eagles executive vice president of football operations Howie Roseman said. "At 24 years old, his best football is still ahead of him. We still have at least one pick in every round and eight total picks in the draft that will take place in Philadelphia in front of our fans in a few weeks." 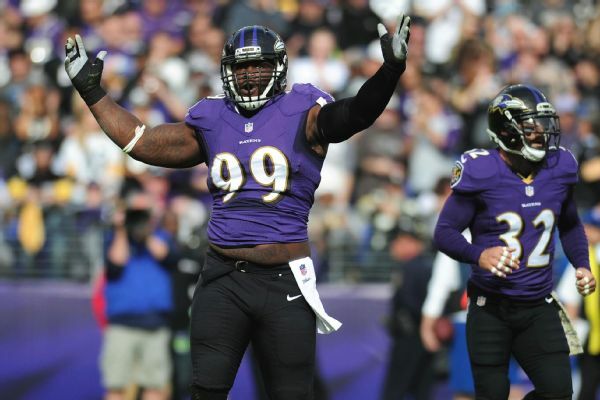 The Ravens were willing to part with Jernigan, who had 13 sacks in his three seasons, because the interior of the defensive line is one of the team's deepest positions. The Ravens re-signed nose tackle Brandon Williams in free agency and return promising second-year player Michael Pierce along with recent draft picks Carl Davis and Willie Henry. Ravens coach John Harbaugh acknowledged at the NFL owners meetings last month that the team was listening to offers for Jernigan. "To me, Timmy is going to have the best year of his career, without question," Harbaugh said. "I know how passionate he is, I know how much he wants to be great." The Ravens will now be without two starting defensive linemen from 2016, after defensive end Lawrence Guy signed with the New England Patriots in free agency.